Sexual abuse happens everywhere: in schools, places of worship, medical offices, playgrounds, and at home. Where it happens doesn’t matter… and does matter. It doesn’t matter, because no matter where children and youth are, every adult, every family and every youth-serving institution should practice safety planning, as well as be aware of healthy sexuality development in order to respond with informed and understanding care to children’s sexual behaviors. Safety planning may include policies and practices, adequate training, and adults who model healthy relationships. And it does matter because the setting where a child or youth is sexually abused may be an environment that not only discourages disclosures, but also fails to recognize warning sign behaviors and dissuades bystanders from speaking up. Total devotion and deference to those in power and treating certain individuals as exempt from wrongdoing, creates atmospheres where sexual harm and violence can flourish. We have to do more to protect children. We need to adopt policies and practices that address children’s safety no matter where they go to school, where they live and what adults are in their lives. And we need to look at the unique features of the diverse settings, ask questions of authorities, and challenge practices that do not protect children. Please read our commentary, Faith In Prevention for more information on prevention in light of recent findings of church-related sexual abuse. Jenny Coleman, Stop It Now! Helpline response from an adult worried that his behaviors as a child may have been harmful to another child. September is Suicide Awareness and Prevention Month. Survivors of sexual abuse are 2 to 5 times more likely to attempt suicide. The experiences of such intimate violation, betrayed trusts, loss of innocence along with the stigma and shame of being a child sexual abuse survivor cause too many to feel that suicide is the only way to deal with the pain. Ending child sexual abuse can mean even more than children growing up free from sexual harm – it can mean saving lives. As we work towards prevention, we must also understand the importance of responding to survivor’s disclosures with respect and kindness; believing them instead of blaming them. We need child victims to feel safe to disclose their abuse AND we need adult survivors to feel safe when they choose to tell their story. Additionally, we want to create safety for people to ask help for themselves when they are worried about their own feelings. We know that the feelings of hopelessness, isolation and separateness can contribute to thoughts of suicide. To learn more about suicide prevention, and responding to disclosures, see the resources below. In our last E-news, we asked you to answer the question, "Who have you had conversations with regarding a child’s sexual safety?" Of the respondents, over 70% shared that they had talked with another child’s parent and/or a relative about sexual safety. Most (86%) had spoken with a friend, while more than 57% had talked to a spouse, an ex-spouse, a professional and/or a neighbor. Thank you to everyone who shared. Keep talking! In our last E-news, we shared information about a new campaign initiated by our partners, Thorn, to reach youth and young adults concerned about online images they’ve seen and/or questions about their own sexual feelings/thoughts about younger children. Since piloting this program in May, almost 500 youth have visited the Now! landing page for youth seeking information and support, and on average, those visitors go on to view an additional four to six pages on the Now! site. Adults who have gone on to abuse children have reported that their first harmful sexual behavior towards another youth happened between ages of 12 and 14. Reaching these young people who are seeking help for themselves is critical for prevention. Join Stop It Now! on September 20, 2018 for the latest, “Dear Stop It Now! Helpline” webinar. This month, we will bring you queries from our Helpline parents who have concerns about warning signs in an adult’s behavior at their children’s school, house of worship and other youth-serving organizations. 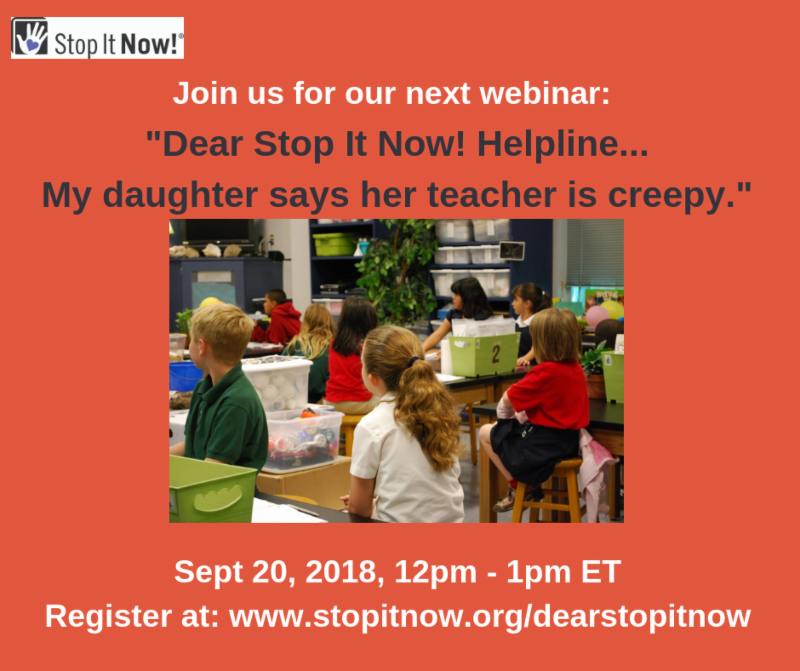 This webinar, “Dear Stop It Now! 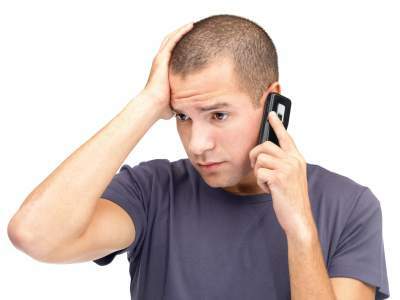 Helpline... My daughter says her teacher is creepy” will emphasize the importance of honest and frank conversations when early warning signs are noted, and help prepare parents and beginning professionals bring up sensitive concerns in children’s environments. to register, click here. Did you miss one of our "Dear Stop It Now! Helpline" webinars? Professionals in youth-serving environments are invited to attend Circles of Safety: Awareness to Action for Professionals Working with Parents and Professional Caregivers on December 5, 2018 in New Britain Connecticut, as well as a Train the Trainer (TOT) on December 6, 2016. Participants will learn and practice new skills to infuse their work cultures with prevention practices and safety planning. For learn more and to register, click here . The Survivors Network of those Abused by Priests (SNAP) is proposing a ‘Save the date’ for a National All Survivors Day on November 3, 2018. This event is designed for all survivors of sexual abuse - not just children and not just in religious communities - but everywhere, including on college campuses, in the military, within sports, and in schools, just to name a few. We want to call out to victims and survivors, and say, we are with you. We welcome your stories. We honor your courage. You are not alone. We especially want to cultivate and create a welcoming culture where victims feel safe to step forward. As you know, most victims of sexual abuse never step forward. © 2018 Stop It Now! All Rights Reserved.